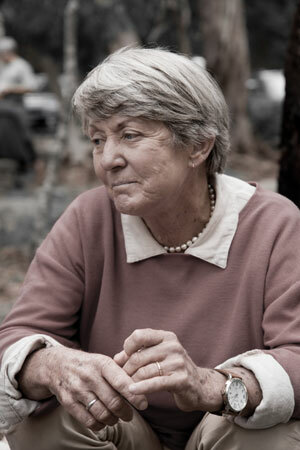 A permaculturist since the 80’s, Rosemary Morrow is based in the Blue Mountains (NSW) and is internationally renowned for her top notch design skills, her ground breaking teaching techniques and her commitment to working with, and for, people who need it most. She tirelessly works across the world including East Timor, Afghanistan, Cambodia, Europe, Solomon Islands, Africa, Vietnam and more. She ooozes integrity, is one of the most down to earth people you’ll come across and is surprisingly short. But don’t’ let this little pocket rocket deceive you, she achieves more in a morning than most and baffles and inspires me with her stamina, enthusiasm and strong character. 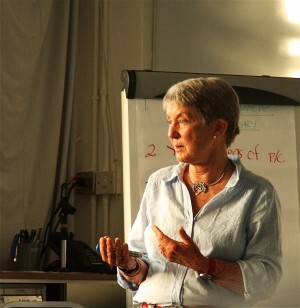 Rosemary is the lead teacher on our upcoming Permaculture Design Course this April 3rd-18th, so we thought we’d introduce you to her so you can get a good sense of this dynamic, talented woman. How long have you been a permaculturalist? Well I started looking in 1978 and then I did my PDC with Robin Francis in 1986 and so from those times. Perhaps I was a ‘natural’ in a sense because consumption and materialism has always been a bit dubious for me. It is never, ever boring. The world simply goes on fascinating and intriguing me, with its possibilities from a design view point. What does permaculture mean to you and you life? I think this was succinctly put by Bill Mollison (co-founder of permaculture) when he said: Permaculture enables what is morally required and scientifically necessary. So for me, a scientist with moral learnings and wanting to be part of the solution and stop being part of the problem, permaculture through its principles and strategies meant that I didn’t have to do my own research, nor put together my own framework. It fell into place and gave my life foundations and meaning. I love living permaculture because the techniques are not always evident and so there is always room for creative personal response. How can permaculture help shape a more healthy, sustainable and just world? Permaculture is about designing strategies for the world that are based on caring for the earth, caring for people and caring for future generations. Within a framework of ethics and principles inspired by nature and by the best that previous cultures had to offer, permaculture offers much toward shaping a more healthy, sustainable and just world. The way permaculture is taught, and has spread from the grassroots up, has meant that permaculture ideas have spread rapidly around the world, particularly in those places that need it most. We are presently going through an explosion of permaculture into minds and disciplines more diverse that I think David or Bill ever expected. For example, my colleague, Lis Bastian, lectures in environmental management for a Bachelors Degree in the international hospitality industry, and permaculture is included in the text for that course. Her students come from over 40 nationalities and will spread these ideas through an industry that is the largest employer in the world. So you can imagine what will happen to the health of the world when these young students graduate. Is permaculture relevant to people who live in the rural AND urban environments? I wasn’t sure about urban conglomerations until I saw Hong Kong and met with local permaculturists with their myriads to ideas, techniques, and determination. The whole of the Hong Kong Botanic Gardens and offices are permaculturally designed. And for rural environments, permaculture will rehabilitate all lands. I can’t think of anything else that will. However permaculture does need to improve its content for coastal areas under threat from climate change and rising seas, something I’m working on now. What type of people would find permaculture useful to integrate into their lives? It is harder to think whether there are any people who would not find permaculture useful. From premiers and kings, men and women in prisons and in every situation people are always better off adopting permaculture into their lives. Whether its cutting bills for energy, and growing food to running community gardens and local banking – it touches all areas of human lives. 1) fortnightly Skype sessions with young Afghanis who are peace volunteers and want permaculture for when peace comes. They are funny and committed and hugely keen to learn. And yet, we tremble when we read of the escalating numbers of civilians dying in Afghanistan and we worry about when and how a just peace can be brought about. 2) more challenging terms of the environment for a small lagoon community in the Solomon Islands which offers a model of how permaculture can respond to vulnerable villages who may not get access to higher land. It is testing and fascinating. And we cannot go quickly! The answers may not lie in land solutions, rather in finding ethical incomes for the villagers. You can follow these two projects (and more) through Blue Mountains Permaculture Institute. And it is time for me to put nearly 40 years of full-time permaculture projects – failures and successes up on the web for everyone to read. When I think back about outcomes from Vietnam, Cambodia, Albania, East Timor and so on, it is apparent that permaculture has so much to contribute and I’d like people not to have to ‘reinvent the wheel’ by learning from my experiences. I also do Skype sessions with Miami, Chile, Argentina and so on. Plus I have a commitment of some degree to the youth of southern Europe with their huge unemployment and so I’ve worked there for the past two years or so and now I am lucky to be invited to work in Greece in a very economically depressed community. The organiser is a brilliant young Greek-Australian permaculturists who has returned to Greece to be part of their future. Rosemary is the lead teacher on our upcoming Permaculture Design Course taking place in southern Tasmania from the 3rd – 18th April. You can understand why we’re excited to have her, it’s going to be a pretty special course with Rosemary at the helm – why not join us! Click here for more information and to register. **You can follow Rosemary’s work through the Blue Mountains Permaculture Institute, NSW. I so enjoyed getting to know Rosemary. Thank you for sharing. Wise words.